One of my favorite heroes was a woman named Edie Windsor who died yesterday at the age of 88. I never had an opportunity to meet her personally, but I know what my family and my community owe her. She helped give a boost to push the journey to marriage equality across the finish line through her refusal to give up on justice for all. And while I understand the significance of this ruling for our country and for the message it sends around the world to other nations about American civil liberties, today the political became personal. I have many personal heroes during the past twenty years of my activism in South Carolina – both sung and unsung. I am grateful to all of them for the labor we’ve made together in the days before Will and Grace and afterwards. 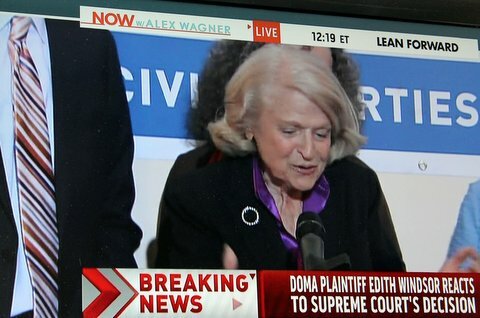 But today is Edith Windsor day for me. I will forever remember the petite 84-year-old lesbian from New York who changed the course of history with an outrageous act and a not-so-everyday rebellion. Thank you, Edie. Yet, this weekend, in the midst of an unbelievable national wave of hatefulness and exclusion, my wife and I went to a shower for two young lesbians who are getting married next month – a natural next step in their belief for the pursuit of happiness as they see it. It was a festive fun evening with the usual “games” for the brides-to-be, great southern barbecue with all the trimmings, a special Signature Cocktail (which I can personally endorse) and champagne for everyone. What made this particular shower different, however, was that the hosts were eleven straight couples with a plus one…all of them friends of the parents of one of the brides-to-be. The parents of both brides were there, and everyone celebrated the upcoming nuptials. As I mingled and talked with our friends who were the hosts, I felt I was in a different universe from the one where I didn’t dare to dream about marrying another girl when I was growing up in rural southeast Texas in the 1950s. It was if a magic carpet had transported me from a land of ignorance to a place of enlightenment. Truly remarkable. And so I wanted to share this joyful time with you, Edie, because you are one of the major reasons these two young women have the same hopes and dreams for their family that their straight friends do. Believe me when I say you were there in spirit. They may not even realize who you are and what you have done for them, but I want to simply say “I do,” and I’m forever indebted. Well done, Edie. Rest in peace. This entry was posted in Lesbian Literary, Life, Personal, politics, Reflections, Slice of Life, The Way Life Is and tagged edie windsor, marriage equality. Bookmark the permalink. For me Edie ranks right up their in my list of heroes alongside Rosa parks, who both just got tired of being “less than” and simply asked to be treated equally. Yes to Rosa Parks, too, Bob – one of my all-time most admired! I so enjoyed this Sheila. Thanks for sharing. Her work will be carried on by the next generation and we all owe her so much gratitude and respect. She was an icon, trailblazer and badass.